I bought a durian ice cream while I was shopping in KSL City Mall in Johor Bahru. It was from a stall in the food fair that was held at the atrium just opposite Tesco Supermarket. When I ordered one cup of durian ice cream, I didn’t took noticed of the price ( thinking that it would not cost much ) and gave the staff RM10. When the staff at the booth returned RM10 cents to me, I realized that the durian ice cream cost RM10; which I felt that it was overpriced. Real Durian Ice Cream. 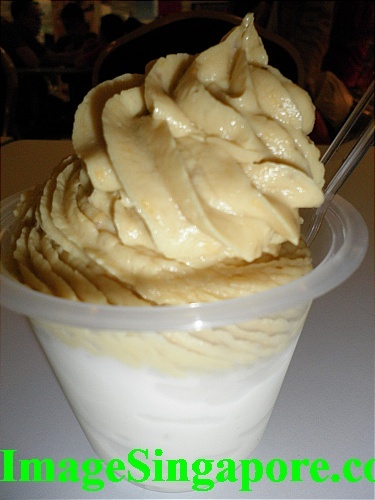 The topping of the ice-cream is made of 100% durian flesh. Anyway, I managed to find an empty table with plastic seats and tried out the durian ice cream. 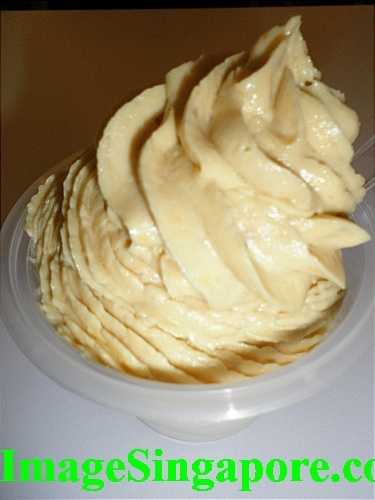 The topping of this ice-cream was made of durian flesh. The taste of the durian topping was bitter and sweet; and with a nice aroma. The quality of the durian used as topping was good and the portion given was quite generous as well. The ice-cream was smooth and not to sweet. Overall I did enjoyed eating this durian ice-cream but I felt that a more reasonable price would be RM7.90. The name of the food outlet selling this durian ice cream was Fonte Deli; which I believed also had a outlet in this mall itself. 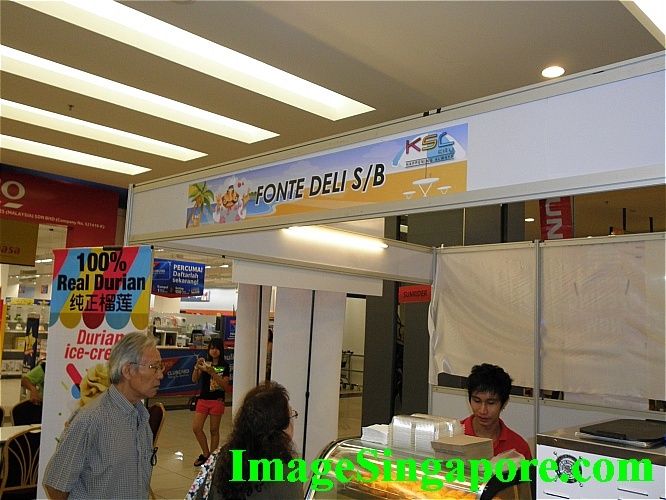 The Fonte Deli food outlet as sells cream puff and frozen fruit yogurt. There was also a stall selling instant coffee and tea bags. A lady sales staff introduced me to their 4 in 1 coffee. It is a blend of black and white coffee added with the usual sugar and cream. I was given a cup to taste the coffee and it was quite nice. So I bought 2 packets and was given one packet free. 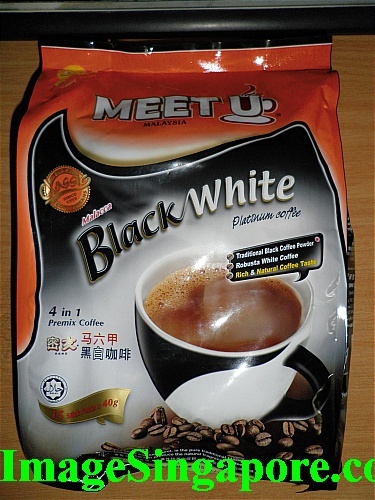 If I could recalled, the cost of one bag of this Meet U brand coffee from Melaka was RM13.50. Besides that, I was also given a nice recycle bag free. Good value shopping indeed. Do visit the food fair in Johor Bahru if you have the time as there are good bargains and value buy offered by some food vendors. 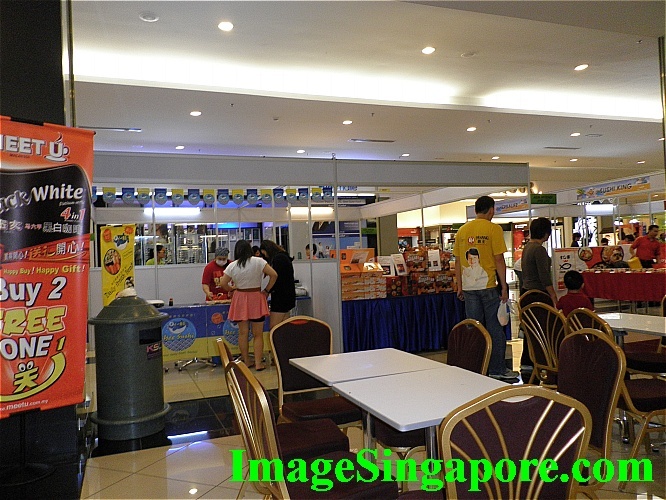 Most of this food fair are mainly conducted in shopping malls in Johor Bahru.